Building a great business case analysis is essential for ensuring that your technology investment(s) are prioritized, funded and staffed properly. Having a conservative, transparent business case analysis (BCA) helps quantify the financial benefits of smart technology investments and eliminates subjectivity. Despite the best laid plans, most projects never stay on budget. According to the Harvard Business Review, one in six IT projects have an average cost overrun of 200%. In order to gain more visibility into why these failures are happening, and prevent them from plaguing your organization, you must be able to understand and monitor the key financial drivers of your project(s). Producing a business case analysis (BCA) will help your company prioritize its technology investments and will provide you with a guideline to manage the team responsible for delivering on the project. However, in order for a BCA to be valuable, it must be accurate, transparent and measurable; and it must provide evidence to the key decision makers as to how the investment aligns with corporate goals and objectives. The first step in a comprehensive business case analysis is to forecast benefits including increased labor productivity, reduced costs and increased revenue and associated margins. Next, project costs, both upfront and recurring, and map benefit and cost projections over time. This allows you to calculate the key metrics necessary to evaluate the business case. In a recent webinar with almost 300 financial professionals, executives reported half currently cite ROI as the most important metric in their case analyses. However, since ROI does not take into account the time value of money, a better measure is actually NPV, which uses the cost of capital to discount investments to "current" dollars. By definition, anything with a net present value less than zero is a poor investment. When evaluating any technology investment, it is important to consider all of the metrics together to compare and prioritize projects. By plotting several potential investments together in the same chart, it is easy to compare the predicted business impact of each. Best practice when producing a business case analysis is to include complete detail of assumptions and projections. Create scenarios to evaluate ranges in projections. For example, create high, medium, low cases based on uncertainty. Mitigate project risk by presenting the "low" case to executive board for approval, and manage the project to the "medium" or "high" case standard. 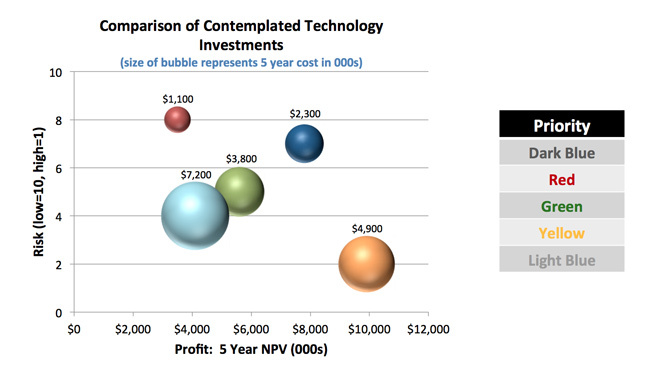 If you want to know more about producing a business case for your next cloud, SaaS technology investment, Technology Finance Partners has published a great white paper, Calculating ROI for Technology Investments. It includes information about overcoming objections to BCA creation, how to leverage financial metrics in evaluating options and tips for best practices, iterations and post-implementation. Please view the recorded webinar at Proformative's website. Registration is FREE!